That’s it man, game over…game over. 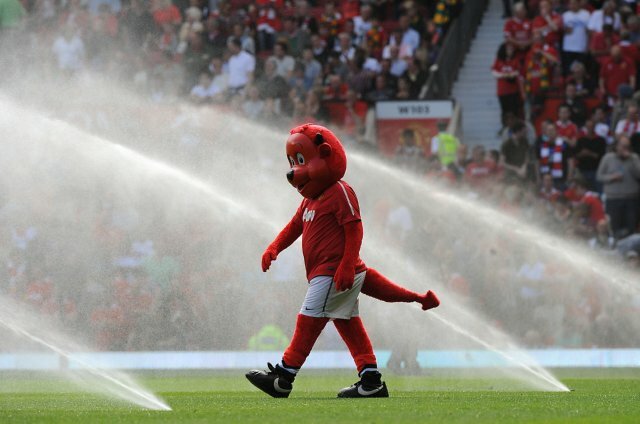 After comfortably seeing off Chelsea at Old Trafford yesterday afternoon, Manchester United now need one more point to seal their record 19th league title and, with Blackburn next up on Saturday, it looks like the trophy engravers can probably afford to give themselves a few day’s headstart. 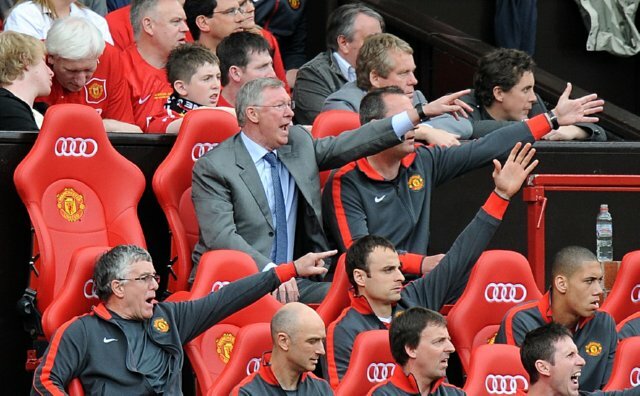 To paraphrase Sir Alex, it’s pretty hard to envisage United ‘mucking it up’ from here. As for yesterday, United went one up after only 36 seconds – Javier Hernandez capitalising on David Luiz’s haphazard positioning to roll his 20th goal of the season home (in fact, Chicharito is the first United player to score 20 goals in his debut season since Ruud van Nistelrooy – how about that? 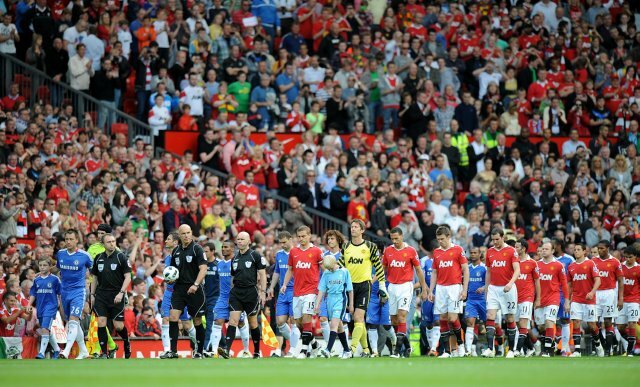 ), before Nemanja Vidic effectively sealed the deal, powering a header past Petr Cech just 23 minutes later. For posterity’s sake, ’twas Frank Lampard that pulled one back for the Blues. 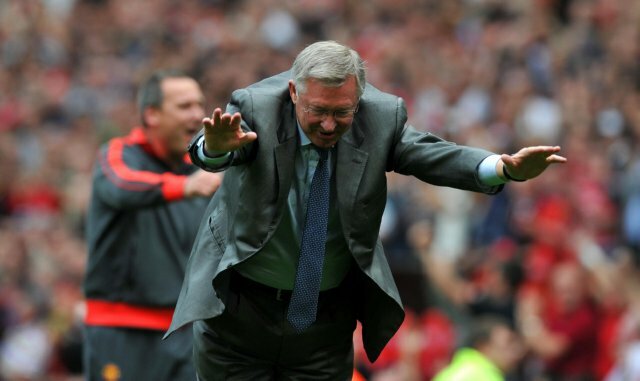 Sir Alex Ferguson bows to the home support after the final whistle. Photos courtesy of the PA. Although the game itself wasn’t that good, it was a great acheivement for United to get the points they needed, and they will now go on to winning an incredible 19th league title. http://www.keelbyunited.co.uk – local football for kids. I would like to know why Pies, Tv shows, pundits, newspapers never go for a Man United win on their predictions..? you guys predicted Schalke 04 to get a draw at Old Trafford for christ’s sake… We are talking about the biggest club in the world with the best manager ever plus Giggs, Rooney, Vidic, Ferdinand, Van der Sar, Evra, Valencia, Chicharito, Scholes, etc, and people always think we are going to lose and get kicked out in the next game. I really don’t understand that. We would have FIVE Epl titles in a row if it wasn’t for a offside goal last season (Drogba) and this season would have ended a long time ago for Chelsea if Luiz was sent off at the Bridge. Oh, I always forgot the 2 goals against Tottenham also at Stanford Bridge… It sounds very strange to me but Manchester United are underrated. Recently it has been more that people have hoped for something to happen for the title race to get interesting. And you have had your weak points this season (although fantastic home record). I think a lot of people do not want man U to succeed and that might come into account when making predictions. Personally I thought it would end 1-1. If chelsea had not had their poor run of form following the dismissal of ray Wilkins you would not be in this position now – I am sure that chelsea would be at the top of the table. I am now a chelsea fan at all – thats just how it is. It is typical of you as a man U fan to blame your failure to have won the title earlier on referee decisions however. I hear so many fans of manchester united talk about this (more than any club) and it really annoys me. Yes you have had decisions go against you this season. But it happens to every club. If i were to go through every man u game this season i would find plenty of decisions that went in your favor. I would also find plenty against arsenal and chelsea – and obviously all the other clubs. It is a part of football and annoying as it is you cant really blame your performance on it. There will have been games that you got points from unfairly. If man u hadnt had so many draws earlier this year THEN you would have the title by now. So stop blaming it on the referees. On an end to this rant I should also say that I am completely for goal line technology in some manner and I also think fergie was right to complain about particularly bad refereeing – all managers should have that right. What I complain about is that these ref mistakes always happen against Chelsea. Two times last season and one time this season, all of them very favourable to them. They scored an ilegal goal at the bridge last season and won 1×0 and another one at Old Trafford and won 2×1. In the end, they were champs by ONE point. You see?? And what happened when the ref did his job properly? we beat them 3 times in a row. Thanks for the congrats, I really respect your opinion!